In this edition of Food & Fun, check out these events. Come out and enjoy free wine tastings while enjoying live music. Picnic with the family. Experience the true country life with chuck-wagon cooking, honky tonk music, special presentation by the San Antonio Pipes and Drums. Join us for Texas Wine, Texas Food, and Texas Fun! 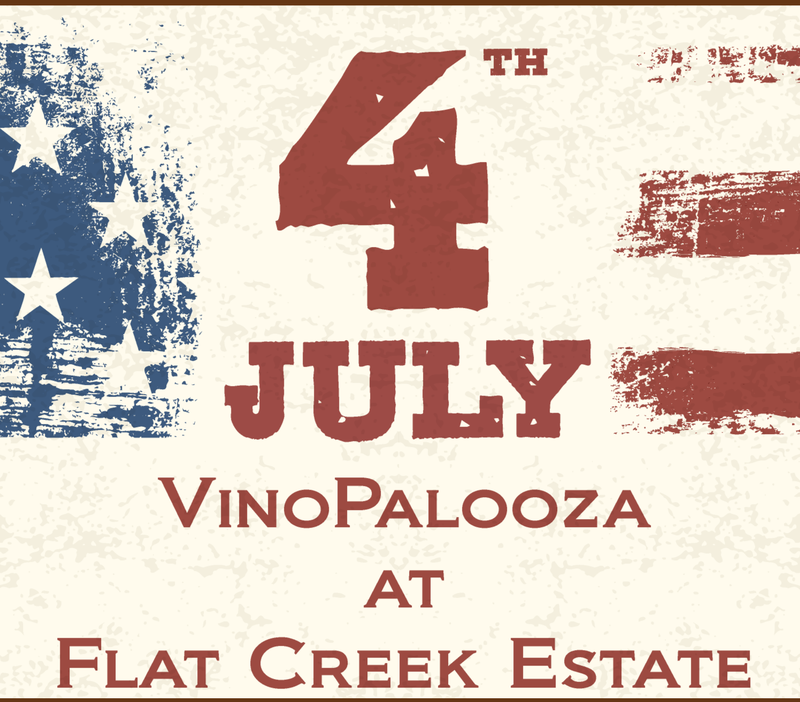 Celebrate Independence Day with the family at Flat Creek Estate. This annual festival is jam packed with Great Texas Wine, Hill Country Fare and Live Music from Local Musicians! The owners and winemakers from across Texas invite you to explore great Texas Hill Country Wines at the annual VinoPalooza Wine Fest at Flat Creek Estate. Limited Tickets Available…Purchase Online Today! The Village of Salado invites you to its second annual “Salado Swirl.” For those who know the “Six S’s” of wine tasting this is the event for you! “See, Sniff, Swirl, Sniff, Sip and Savor.” The “Salado Swirl” will be held throughout the Village of Salado. This one-day event promises to satisfy all of your culinary delights from wine tastings to enjoying local cuisine while listening to music. The following Texas wineries and Salado shops participating are: Salado Creek Winery will be hosted at Salado Glassworks; Salado Wine Seller will be hosted at Salado Wine Seller; Fiesta Vineyards will be hosted by Springhouse; Rising Star Vineyards will be hosted by Charlotte’s of Salado; Messina Hof will be hosted by Prellop Fine Art Gallery; Georgetown Winery will be hosted by Magnolia’s; Dancing Bee Winery will be hosted by Salado Mercantile; The Vineyard at Florence will be hosted by Horsefeathers; Red Caboose will be hosted by YOUphoria Day Spa; Inwood Estates will be hosted by The Howling Wolff; Flat Creek will be hosted by Classics on Main; Grape Creek will be hosted by The Pizza Place and Paris Vineyards will be hosted by Thomas Kincaide Gallery. This is a ticketed event for $24.95 per person. Tickets must be purchased in advance at www.saladoevents.com. There is a limited amount of tickets so make your purchase soon. Transportation will be provided. For event details, updated information and ticket information visit us online at www.saladoevents.com or contact the Village of Salado Tourism office at 254-947-8634 or dcharbonneau@saladotx.gov. Touring the Texas Bluebonnet Wine Trail on the Harvest Trail is your opportunity to celebrate grape harvest and crush in southeast Texas. On the last two weekends in July, the NINE member wineries along the trail will offer a select pairing of two wine tastings and a fabulous food pairing to each ticket. Plus, each ticket holder will receive a unique, commemorative 2013 wine glass charm at winery. Visit SIX of the NINE member wineries, and each ticket holder receives additional "2013 Texas Bluebonnet Wine Trail" charm. Visit ALL NINE member wineries and each ticket holder will receive a commemorative Texas Bluebonnet Wine Trail two-stage professional wine opener. The value of this ticket, with goodies is over $80 per person, so take this opportunity to visit local Texas wineries at half the price. Your trail tickets are good on any of the dates, July 20-21 and July 27-28, 2013, regardless of when you purchase them. Blaze your own trail and pick where you want to start and where you want to end. You have four days over two weekends to visit all NINE wineries. The official hours for this event are 11:00 a.m. to 6:00 p.m. on Saturday and Noon to 5:00 p.m. on Sunday for each trail weekend. All wineries are open during the official trail hours. Several wineries open earlier or close later than the official hours, so please check the Texas Bluebonnet Wine Trail website for specific winery hours. The Texas Bluebonnet Wine Trail wineries remind you to drink responsibly and designate a driver. Experience the 2013 Harvest Trail in luxurious style and save more than $50. The Texas Bluebonnet Wine Trail has partnered with La Torretta Lake Resort and Spa on Lake Conroe to bring you the ultimate weekend getaway. This ticket includes a King Tower Suite (1 King Bed in the bedroom with a separate living room) at La Torretta Lake Resort and Spa on Saturday, July 20, 2013 PLUS a ticket-for-two to tour the NINE wineries on the Texas Bluebonnet Wine Trail during the 2013 Harvest Trail. Your hotel room is only available on Saturday, July 20, 2013. Tour the wineries at your leisure on Saturday, return to your hotel suite and enjoy the fine dining at La Torretta Resort or order room service for a cozy evening in style. Your wine trail ticket is valid on ALL trail dates, July 20-21 or July 27-28, 2013, just in case you don’t leave the hotel! The La Torretta team will contact you to confirm your reservation shortly after purchase. This ticket DOES NOT include hotel taxes. It DOES include the Resort Fee and a $10 credit to be used at Mokka Café. This purchase is NON-REFUNDABLE. Guests must provide a credit card upon check in for incidental charges. Guests may upgrade to a Double Tower Suite (2 Queen Beds with a separate living room) for an additional fee of $20 at the time of check in. Sorry, La Torretta does not allow pets.